This classic bone is a safer alternative to wood sticks and is best for dogs who love to gnaw and play fetch (especially in water). Made from our bouncy and floatable Zogoflex® material, Hurley is extremely durable. Hurley's classic design makes it easy for dogs to carry in their mouthes while its bright colors, make Hurley easy to spot indoors or out. A best-seller since 2006. Limited edition ruby red color is available for the holiday season only. Please remember your dog’s safety is your responsibility. No dog toy is indestructible. 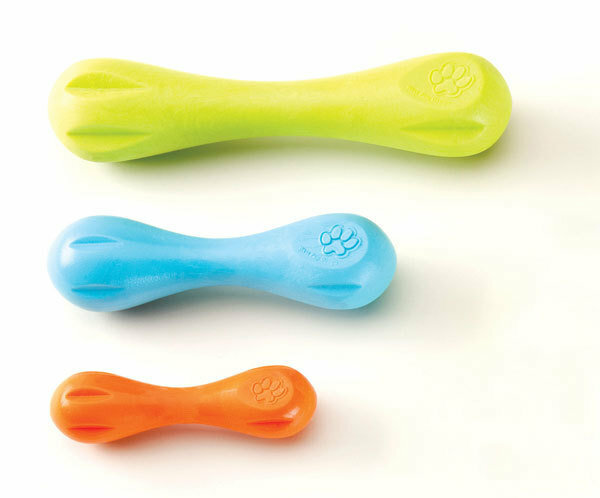 Choose only toys that are the appropriate shape and size for your dog and always supervise your dog’s use of toy. If your dog is one of the few that can damage one of our tough Zogoflex toys, please discontinue use of the toy immediately and take advantage of our Love It Guarantee™.